For those of you who have been following my progress (thanks for sticking around), there have been some changes to the home lab setup. 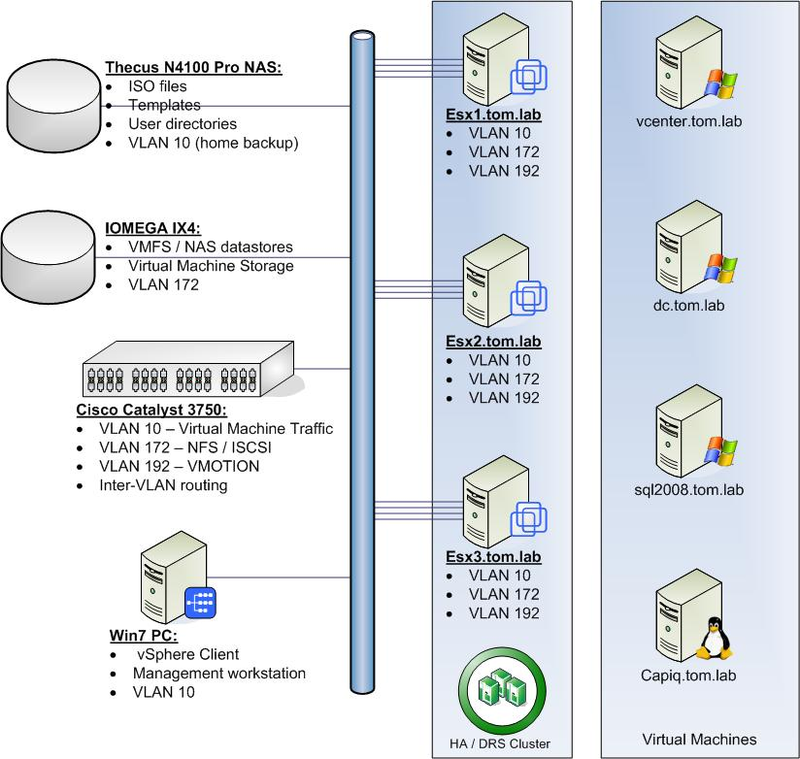 You may recall, in my post last fall – Home Lab, Part 2 – I was having some network issues. I enlisted the assistance of one of my local Cisco System Engineers to troubleshoot (Jeff Manning – Jeff, if you’re out there, thanks, man!). Unfortunately, our initial round didn’t go anywhere. But he ws generous enough to help me install a Cisco 3750 for testing purposes… (I had serious questions about the little Dell Powerconnect I was using, but mostly it just wasn’t sophisticated enough to properly create andn manage VLANs and give me proper diagnostics). Through lots of cable swapping and port swapping and multiple reconfiguration of my ESX vSwitches, I was finally able to determine that several of my NICs were bad…. I guess storing them in my attic turned out to be a bad idea, since a couple of them apparently got baked. 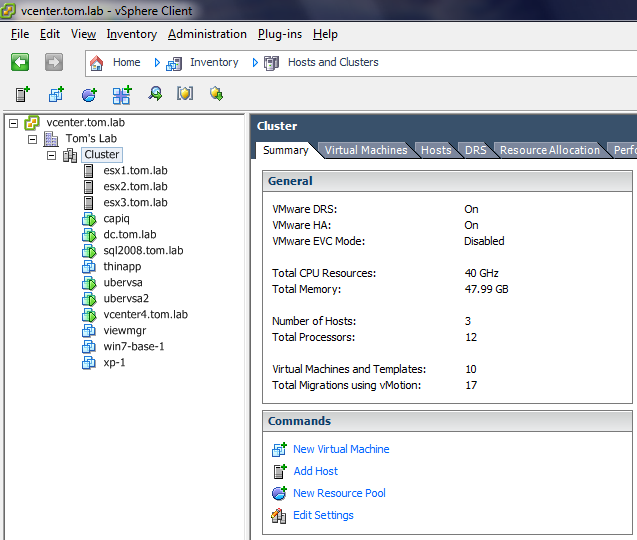 Here we see the three ESX servers have been configured in a VMware High Availability Cluster with DRS enabled to automatically apply Priority 1-4 recommendations. Other than the Windows PC used to manage the environment and the ESX servers themselves, all workloads were run as virtual machines. This includes VMware vCenter, as well as the Windows Active Directory Domain Controller, and the Microsoft SQL2008 server used for database connectivity. 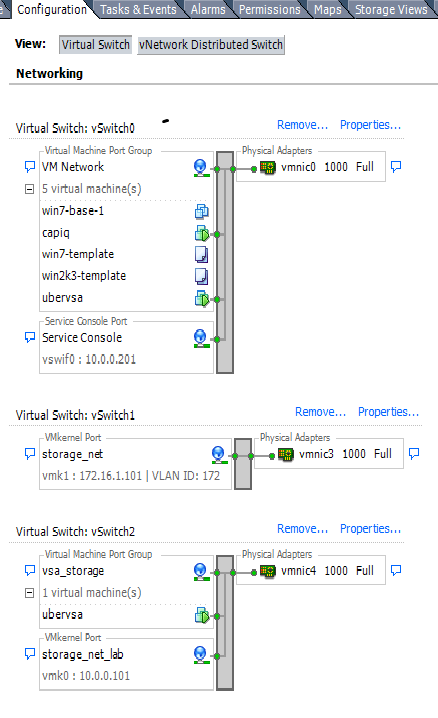 This entry was posted in From the field, Home Lab, Miscellaneous, TechInfo, Virtualization - Desktop, Virtualization - Server and tagged ESX, howto, lab, powerpath virtual, training, Virtualization, Vmware, VMware-HA, vsa. Bookmark the permalink.